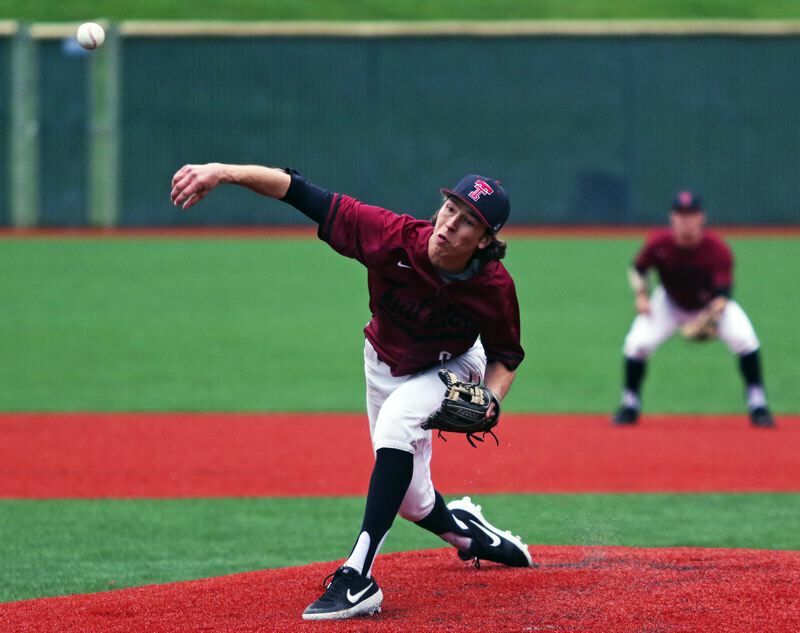 TUALATIN — Good pitching. Timely hitting. Clutch defense. 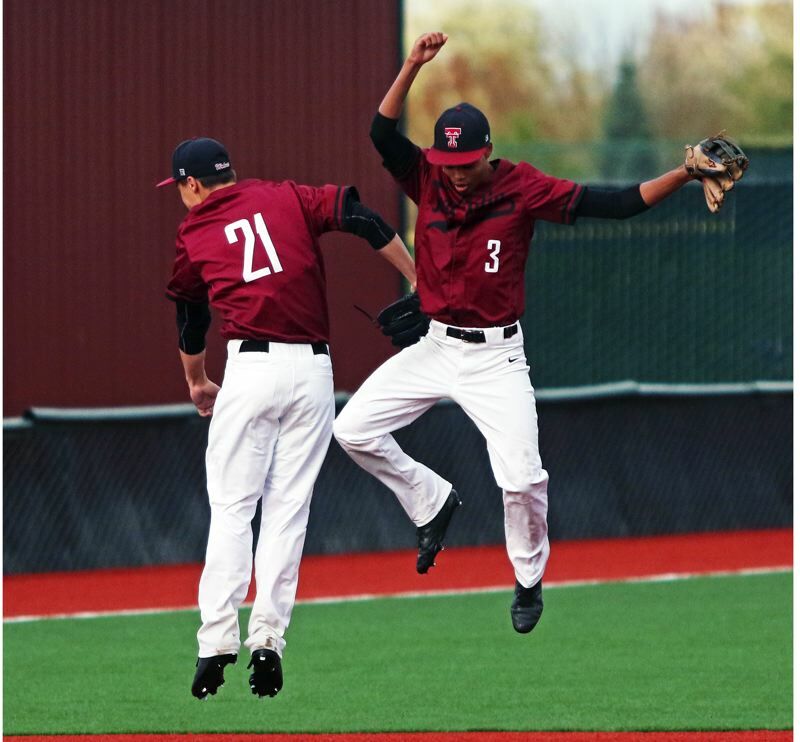 Put them all together, and you get another league win for the Tualatin High School baseball teams. 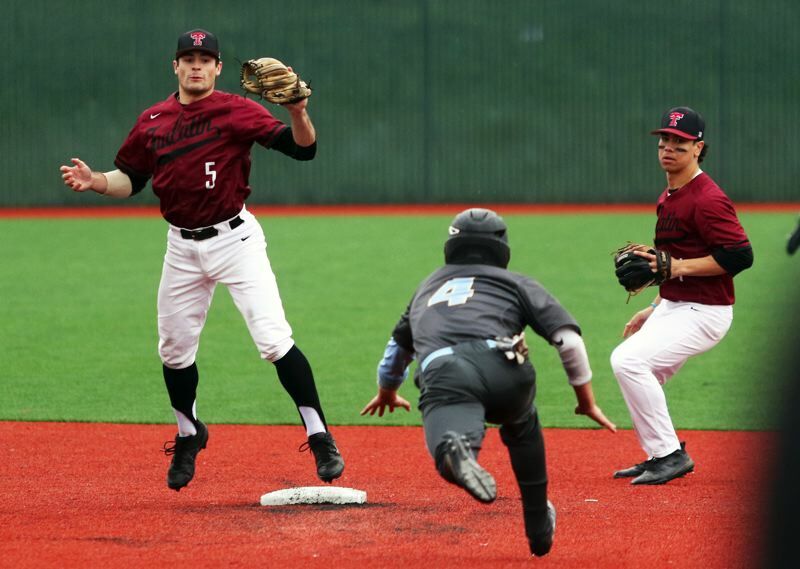 The Timberwolves, stepping up in key moments, came away with a 5-3 victory over Lakeridge in a Three Rivers League contest played Monday at Tualatin High School. "It went really well," said Tualatin senior Cameron Atkinson, who was the winning pitcher in Monday's contest. "I've got a lot of confidence in my guys, knowing they can back me up in the infield, and we got a lot of hits. Overall, it was just a very solid game today." 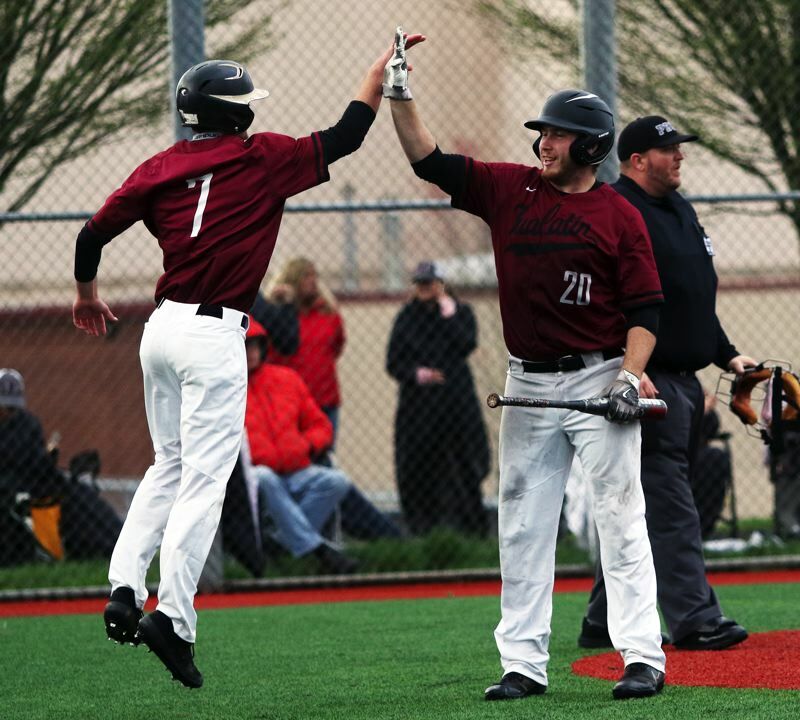 "I feel like that's how we expected it to go," said Tualatin junior catcher Blake Jackson, who had a run-scoring double in addition to throwing out three runners on base. "We thought that they'd be pretty tough, but we had our guy, Cameron, on the mound today." With the win, Tualatin improved to 3-1 in TRL play (8-2-1 overall), putting the Timberwolves in a tie with Tigard and West Linn for first place in the league standings. "The key has been our defense, for sure," Atkinson said. "We've had solid defense during every one of our outings, and our pitching has been on. Everyone is contributing." "I think we're doing great," Jackson said. "I'm proud of my team, and how we've been doing, and how we get along. Everyone's getting along well, and we're all contributing." Lakeridge moved to 1-3 in TRL games (7-4 overall) with the loss, putting the Pacers in a tie with Oregon City for fifth place in the league standings. The Wolves were able to strike first in Monday's game, getting a run in the bottom of the second inning. Senior Gavin Moore got things started with a two-out single to right field. 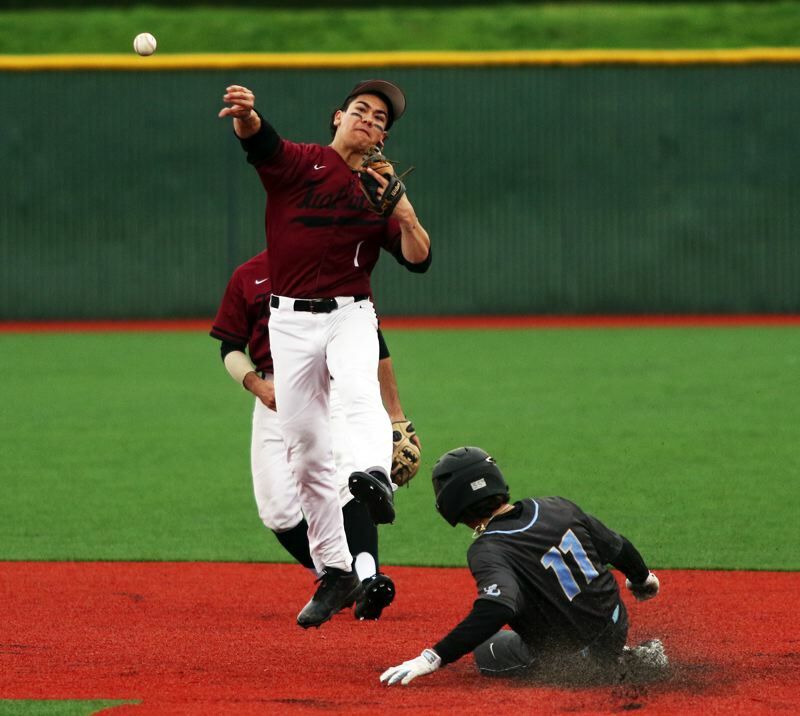 Moore then stole second base and, after junior Shaun Christensen drew a walk, he scored when Lakeridge committed a throwing error on a grounder by senior Tyler Anderson, giving Tualatin a quick 1-0 advantage. The Timberwolf defense also shined in the early going. Jackson threw out a Lakeridge runner on a stolen base attempt in both the first and third innings. And, later in the third, he threw out another Pacer runner trying to advance on an overthrow. "I'm just doing my best to help out Cameron," Jackson said. "If he's throwing such a good game, I want to do my best behind the plate to help him out any way I can." 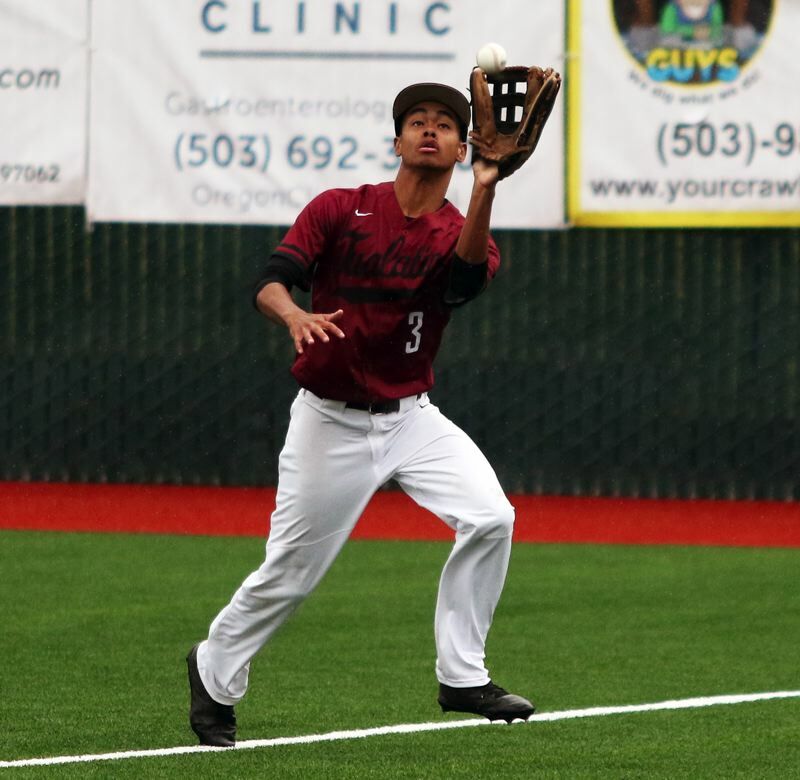 Then, in the bottom of the third inning, Jackson ripped a two-out double to center field, driving in senior Jett Searle, who had a one-out bunt single, upping the Tualatin lead to 2-0. "He's my friend, pitching to me," Jackson said of Lakeridge junior starter Cooper Justice. "We've played each other a lot, and we've been on the same team, so I just wanted to get one, and I got it." Lakeridge cut the lead to 2-1 in the top of the fourth, when sophomore Cameron Clayton scored from third on a bunt by junior Brian Hamlin. The Wolves answered back with two runs in the bottom of the fifth inning, with junior Campbell Clarke doubling in both senior Cameron Springer and Jackson, making the score 4-1. 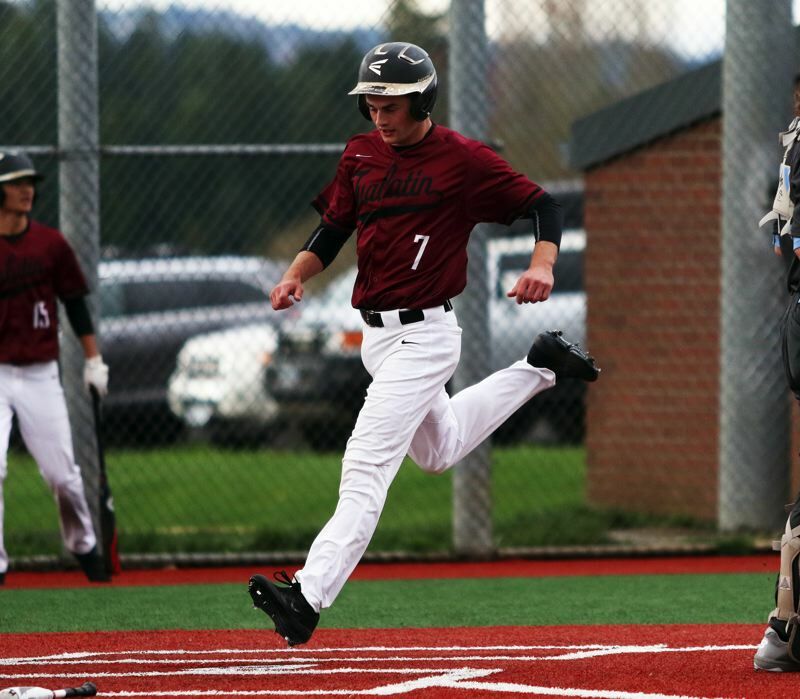 Tualatin got another run in the bottom of the sixth inning, when senior Lucas Diggins scored on a Lakeridge throwing error, upping the margin to 5-1. But the Pacers came battling back in the top of the seventh. Two singles and a walk loaded the bases with no outs in the frame. Clayton then scored on a groundout by Justice, making the score 5-2. Senior Casey Smith then singled in junior Spencer Gore, cutting the lead to 5-3, while also putting the tying run on base with one out in the inning. But Tualatin junior Luke Rogers, taking over the pitching duties in relief, got Pacer junior John Taylor to hit a grounder to senior shortstop Kyle Dernedde, who started a 6-4-3 double play, with Atkinson, who moved to second base, making the relay throw to Springer at first to end the game. "I thought it was clutch that we were able to close out a game at the end," Jackson said. "I was proud of my team today." "Our mentality this year is that we've got a lot of guys who can back everyone up," Atkinson said. "We have a lot of confidence in each other." Atkinson, in getting the pitching win, gave up three runs on four hits in six-plus innings of work. "He was throwing well," Jackson said. "The whole game, he was hitting his spots. They were having a tough time hitting him. And, when they were hitting them, they were weak hits. He always comes out and does well for us." "It went really well," Atkinson said. "I just have a lot of confidence in the guys behind me. Justing knowing that you have guys that are going to back you up, that's a huge part of the game." 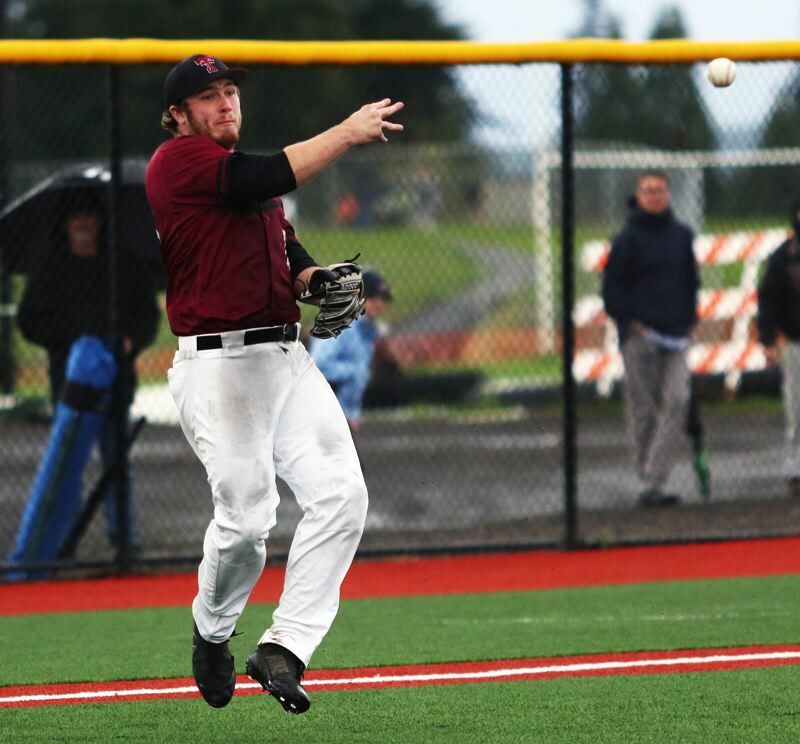 Tualatin had five hits in the game, with Searle, Springer, Jackson, Moore and Clarke having one hit apiece. The teams will play the second game of their three-game series on Wednesday, starting at 5 p.m. at Lakeridge High School. The series will finish Friday with a 5 p.m. game at Tualatin. On Tuesday, the Wolves will travel to Canby for a 5 p.m. league game.